Here's tidbit of info I'll bet you didn't know: The Koopa Kids (or Koopalings, depending on which way you swing) were pegged, at one point, to be the bosses in Super Princess Peach. At least, that's what the guy/gal responsible for Random Hoo Haas has discovered. 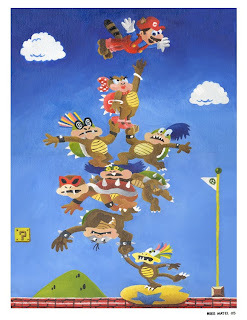 Apparently, Wendy O' Koopa (my favorite Koopa Kid) was the original boss of World 6, for instance. "The only obvious attacks I can see from her animation are a jump and her ability to throw one of her bracelets at Peach," says the proprietor/proprietess of the site. "She also has an animation where she points upwards and strikes a pose, and another where she faces the screen and stands with her arms in the air; presumably both were for summoning an attack from something else." Descriptions of the other Koopa Kids' animations and probable attacks can be found here. After you check them out, take a second (or two) to check out the rest of the games highlighted in the "Oh! My God!! Why'd They Change That?" section of Random Hoo Haas. If you're a retro-gaming geek like I am, you won't regret it. I wonder why they scraped them, too. Maybe they were too challenging, or they didn't fit in with the game for some reason--or maybe Nintendo stepped in at some point (since the game was developed by Tose, not in-house) and said, "No, we should save them for the next Mario game." Well yeah, anyone with half a brain can see the Koopa Kids are a no-brainer. And Wendy O. Koopa? My favorite, too.